As the subtitle explains, this anthology collects the most powerful and influential short stories published in the evolving genre of "furry" or "anthropomorphic" fiction. Furry fiction revolves around sentient animals or characters who have animal aspects, including everything from genetically engineered creatures to hairy aliens to werewolves. Although related to science fiction, fantasy, and horror, this branch of speculative fiction has a style all its own and deserves independent recognition as such. Also worth noting are the handsome illustrations scattered through the book, reprinted from the original publications along with their matching stories. Do not, even if it is customarily your practice, skip reading the nonfiction parts of this anthology! These include an introduction by Fred Patten, a note from publisher J.L. Eddy, the Section One foreword by Tim Susman, the Section Two foreword by Gene Breshears, the Section Three foreword by Phil Geusz, and the afterword and bibliography by Fred Patten. This material alone is worth the price of the book, as it covers in loving detail the evolution and characteristics of furry fiction. Many of the featured stories come from a large volume of writing set in the same universe, so there are pointers describing the characters and setting of the more spectacular examples. These folks have a lot to say about genre development. Don't miss it. The anthology breaks down into three sections. Section One is Living Among Us: Furries and Humans. It explores the relationships between humans and nonhumans, the myriad opportunities to repeat old mistakes in new ways ... or to go beyond them. "To the Magic Born" by Brian W. Antoine presents a quiet picture of a mixed human/furry family of Mages, and what happens when one of the children manifests magical talent. Lawrence Watt-Evans introduces a mainstay motif of furry fiction -- slavery -- in "Foxy Lady," but the story's sweet and thoughtful tone illustrates how we can rise above the lowest common denominator. Kim Liu revisits a similar quandary with a much darker tone in "Crucible," where the struggle for freedom turns violent. "A Snapshot from Fayetteville" by Mick Collins illuminates the differences of furry culture in a charming way, while still connecting them to humanity. Todd G. Sutherland's haunting story "Wings" speaks of the true nature of love and loyalty. In his historical tale of pirates, Jeff Eddy reminds us to "Respect the Sea." Section Two is Living Apart: Furry Alternate Worlds. Here we get to see how anthropomorphic cultures might develop all on their own. "Port in a Storm" by Robert K. Carspecken investigates the value of belonging vs. the value of individuality. M.C.A. Hogarth brings us a splendid tale of language, culture, manipulation, and creative problem-solving with "Rosettes and Ribbons." Elizabeth McCoy's "Recruiting" suggests that trouble isn't a matter of problem personalities, but rather of personalities in the wrong context. Craig Hilton sets up a concise and entertaining mystery in "Whimper's Law." Through "Messenger," Mel White considers what things are best remembered ... or forgotten. Section Three is Living Within: Transformation. It captures the process of changing from one form to another, one life to another. Some of these stories throw the sharpest emphasis on what it truly means to be "human," not in body but in spirit. By far the best of this set is Phil Geusz's "Graduation Day," a complex story about several high school students and their counselor, who face tremendous challenges due to their changed bodies and instincts. The underlying message is one of connection, understanding, and plain old refusal to surrender to life's hard knocks. It's a must-read for anyone who thinks they're stuck in a clunker of a body. "Top of the Mountain" by Ben Goodridge demonstrates the power of love and sacrifice. Tim Susman's "Find the Beautiful" shows what can happen when what you are turns out to be different from what you wanted or expected. 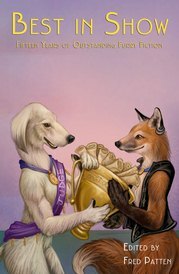 The stories of Best in Show span a wide range of speculative fiction subgenres, yet combine to give a firm impression of furry literature itself. They will make you laugh, they will make you cry ... they will make you think. At least some of them will probably make you uncomfortable. Ask yourself what you'd do in some of these situations. Be honest. Share the ideas with your friends, if you're bold enough. These are stories you can talk about for hours and not get tired. Most highly recommended. Watch for more publications of serious furry literature from Sofawolf Press too.